Originally from Serbia (Mira) and Austria (Sasha), the Zivanovs minister to refugees from the former Yugoslavia, which includes the countries of Bosnia, Slovenia and Croatia. The Zivanovs will work in partnership with Kirkwood Baptist Church and other local churches. One of the important outreach ministries to refugees are food pantries. 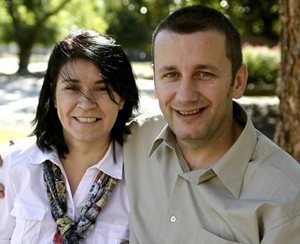 The Zivanovs hope to develop other outreach programs, including English and computer classes and starting a church among refugees.